Peptide (C)KNANFTGPNQTSSNS, corresponding to amino acid residues 21-35 of human α1B-adrenoceptor (Accession P35368). Extracellular, N-terminus. Homology Mouse - 14/15 amino acid residues identical; rat - 13/15 amino acid residues identical. Standard quality control of each lot Western blot analysis (unlabeled antibody, #AAR-018), and live cell imaging (labeled antibody). ___ Cells + Anti-α1B-Adrenergic Receptor (extracellular)-ATTO-488 Antibody (#AAR-018-AG), (10 µg/5x105 cells). Cell surface detection of α1B-Adrenoceptor in GH3 cells with Anti-α1B-Adrenergic Receptor (extracellular)-ATTO-488 Antibody (#AAR-018-AG) (green). 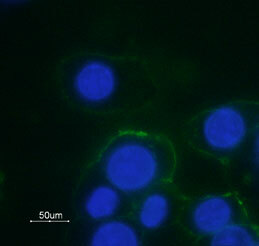 Nuclear fluorescence staining of cells using the membrane-permeable DNA dye Hoechst 33342 (blue). Perez, D.M. et al. (1993) Mol. Pharmacol. 44, 784. Minneman, K.P. (1988) Pharmacol. Rev. 40, 87. Schwinn, D.A. et al. (2004) Mayo Clin. Proc. 79, 1423. Adrenergic receptors (also called adrenoceptors) are the receptors for the catecholamines adrenaline and noradrenaline (called epinephrine and norepinephrine in the United States). Adrenaline and noradrenaline play important roles in the control of blood pressure, myocardial contractile rate and force, airway reactivity, and a variety of metabolic and central nervous system functions. Adrenergic receptors are members of the G-protein coupled receptor (GPCR) superfamily of membrane proteins. They share a common structure of seven putative transmembrane domains, an extracellular amino terminus, and a cytoplasmic carboxyl terminus. Anti-α1B–Adrenergic Receptor (extracellular) Antibody (#AAR-018) is a highly specific antibody directed against an extracellular epitope of the human α1B-adrenoceptor. The antibody can be used in western blot, immunohistochemistry, live cell imaging and indirect flow cytometry applications. It has been designed to recognize α1B-adrenoceptor from human, rat and mouse samples. Anti-α1B-Adrenergic Receptor (extracellular)-ATTO-488 Antibody (#AAR-018-AG) is directly labeled with an ATTO-488 fluorescent dye. ATTO dyes are characterized by strong absorption (high extinction coefficient), high fluorescence quantum yield, and high photo-stability. The ATTO-488 label is analogous to the well known dye fluorescein isothiocyanate (FITC) and can be used with filters typically used to detect FITC. Anti-α1B-Adrenergic Receptor (extracellular)-ATTO-488 Antibody has been tested in direct flow cytometry applications and is especially suited for experiments requiring simultaneous labeling of different markers. Anti-α1B-Adrenergic Receptor (extracellular) Antibody (#AAR-018), (for western blot analysis).